Production Designer Stuart Craig has quite a CV. Beyond being the BAFTA award-winning designer for the entire Harry Potter film series, he has also won three Oscars, for The English Patient, Dangerous Liaisons, and Gandhi. He has worked on over three dozen films, including as art director on classics A Bridge Too Far (1977) and Superman (1978). Do you love Notting Hill, The Mission, or The Elephant Man? He worked on those, too. He has continued his part in translating J.K.Rowling’s vision for the cinematic world with last year’s Fantastic Beasts and Where to Find Them, and is currently working on The Crimes of Grindelwald, which is being released in 2018. He is essentially the architect of the world we see onscreen for all the Harry Potter movies. Indeed, as directors came and went, his involvement stayed consistent. An argument could be made that continuity, and the loyalty of fans to commit to every film, are largely to his credit. 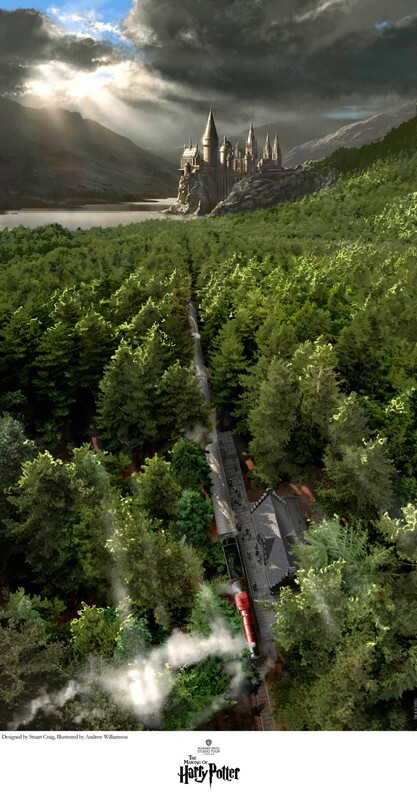 When the Harry Potter studio tour at Leavesden was opening, Ruth Clampett, who has always been the conduit between Warner Bros. and the art world for all things Harry Potter, worked to get the art used to create the environments, that so compelled fans of the franchise, into the tour. She wanted Stuart Craig Harry Potter prints to be available for purchase by his fans. Ruth has always been a great judge of what Harry Potter fans want, since she herself is a superfan. 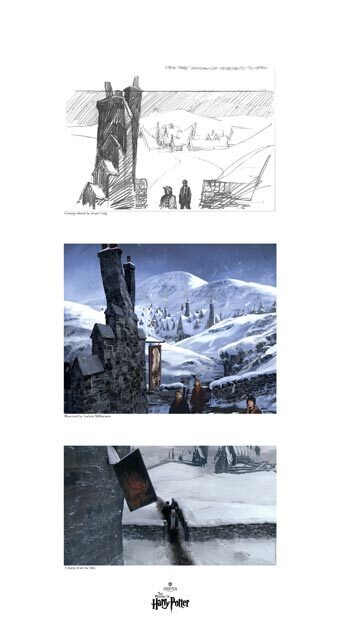 I remember when I spoke to Stuart Craig, he said he couldn’t imagine anyone wanting his concept images. The pieces Ruth wanted to release were of finished and “in process” concepts, which were created by both Stuart Craig, who drew out the graphites, and architectural and concept artist Andrew Williamson, who finished them in colorful, fully rendered concept images. Williamson is now the Global Head of the Art Department at Double Negative. Double Negative has worked on Avengers: Infinity War, Black Panther, Fantastic Beasts and Where to Find Them, Justice League, Blade Runner 2049, and many more of the biggest films of the last nearly 20 years. Ruth went about selecting images evocative of the film series, that would resonate with fans in both the UK and the US. It required quite a bit of convincing to get the art into Leavesdon, but when she did, they were a huge success, much to Stuart Craig’s surprise. Production designers see their work as a means to an end. 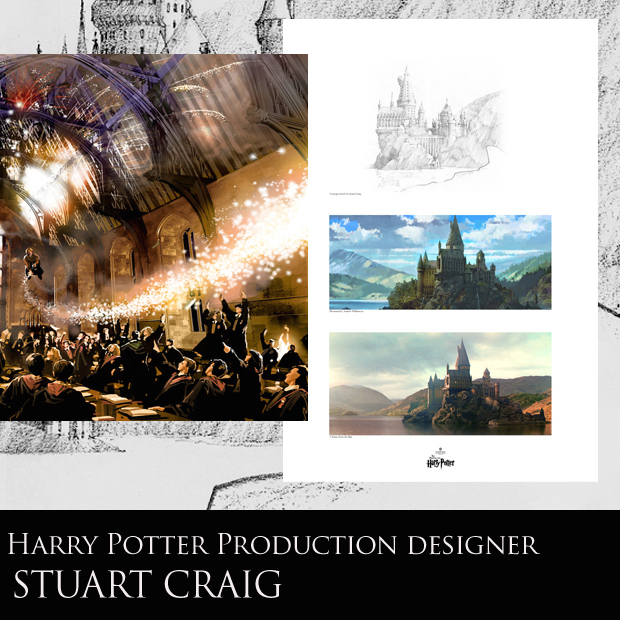 It was hard for him to picture fans wanting to put Stuart Craig Harry Potter prints as art on their walls. My experience is quite the opposite. 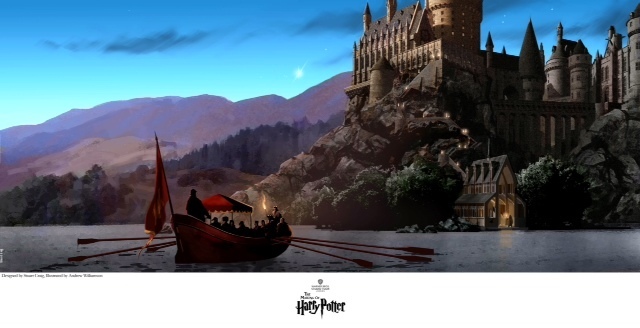 Because I was involved in selling official Harry Potter art to collectors from the very beginning, I knew many of the collectors who loved and bought the art of book cover artist Mary GrandPre who had embraced the films would also collect art by the man partially responsible for bringing the world of the books to the screen. I love seeing how a movie comes together. I love seeing design, alteration, and creativity as it develops ideas into physical form. Not enough people realize how much the production designer and their team influence the finished film and how it’s received. 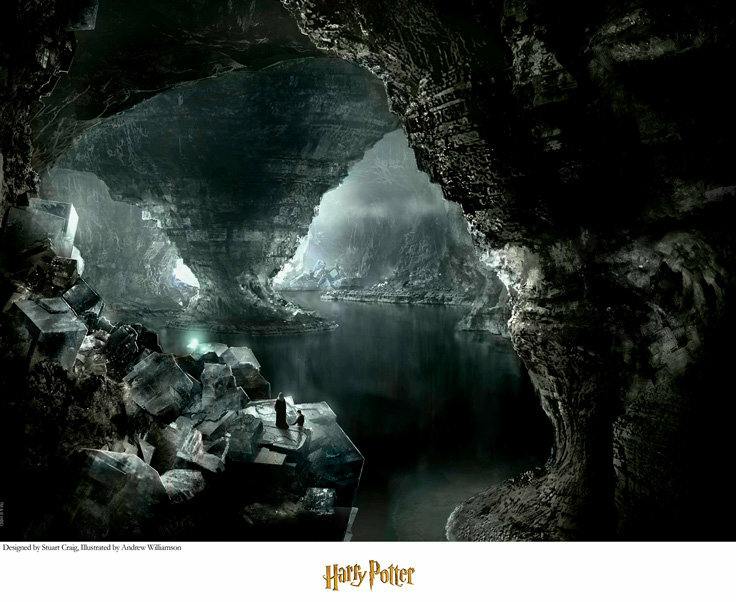 Take a look at the many wonderful images of Harry Potter concept art by Stuart Craig on our ArtInsights page for the production designer. Because we were in it at the beginning, we get to have limited editions by him that say “Warner Bros. Studio Tour London” on them. Meanwhile, I spoke to Stuart in 2011 before the release of the first of the two last films. I just posted it on YouTube as a video (it is mostly just my phone interview, but there are pictures of his art accompanying it)–if you want to hear a bit about his career in his own voice, check it out HERE.